The question at the centre of Massy Tadjedin's directorial debut, Last Night, is whether the actual physical act of infidelity is worse than that of the emotional nature. It's the sort of sharp, observational adult relationship movie that doesn't get made much anymore, given that it's more about the unspoken, silent moments of tension than actions and events. Shaking out as the kind of film that could easily have played on stage for a live audience, this human drama is ostensibly three extended conversations occasionally interrupted by co-workers and erroneous friends that merely exist to reveal facts of an expository nature or do some dime store psychological probing. 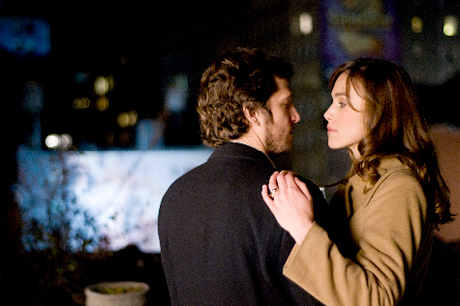 At the centre of everything are married couple Joanna (Keira Knightley) and Michael Reed (Sam Worthington), a bland, upper-middle-class pair whose preliminary marital high is dying down, along with their mutual attraction, replaced with a heightened awareness of each other's flaws and social mannerisms. Joanna observes a quiet flirtation between Michael and his colleague, Laura (Eva Mendes), at a work function, wondering why he had never mentioned her or how pretty she was. The discussion reveals relationship dynamics through gentle manipulation, breaking it up for logical arguments about stacking magazines in front of electrical outlets. Once the conflict is established, the film moves on to a business trip where Michael and Laura flirt with the possibility of having an affair, while Joanna runs into an ex back home that challenges her moral perceptions of faithfulness. Aside from occasionally peculiar editing choices, Tadjedin's approach is quiet distance and observation, letting the actors tell the story with body language and eye contact long after their dialogue has been delivered. Soft music builds a sense of discomfort as we realize that their decision of whether or not to act on their feelings of lust — needing to still feel desirable after years of marriage — is secondary to their confiding emotionally in a third party.